Monitoring equipment is often the last element considered in a broadcast system build, and getting its deployment just right is not always a top priority. However, most operations managers and broadcast engineers readily acknowledge the critical role that effective monitoring plays in making their jobs easier. This is especially true today, with broadcast networks growing ever more complex and relying on technologies that were not originally intended for the broadcast environment. Such industry trends have led to the introduction of more problems within the broadcast chain, and the resulting increase in failures has made monitoring a more essential part of operations. To ensure that they address potential problems effectively, broadcasters must monitor at all demarcation points - the inputs and outputs of any system, whether the signal is being sent from one component to another or from one facility to another. Key demarcation points could include the interface to a third-party within the broadcast chain or to the bill-paying customer. In the latter case, violation of the terms of a service-level agreement can cause a problem with the signal handover to result in large fines. Implementing Effective Confidence Monitoring Without sufficient confidence monitoring, broadcasters have difficulty pinpointing the cause of any issue that may arise. The key to implementing an effective (and cost-effective) monitoring solution is to make it as simple as possible to identify problems on any part of the network. If a monitoring solution is too complicated, expert engineers must be redirected from other critical tasks in order to run the monitoring tool. A straightforward unified monitoring system makes it easier for less technical staff to catch and fix faults. Monitoring models typically fit into two groups: remote monitoring in central operations and local monitoring in equipment rooms used by engineers. Wohler Technologies' MPEG Series monitors are ideal for equipment room installations, where they give the engineer eyes on the streams going in and out of the broadcast center. As the first and only compact audio and video monitoring solutions to handle incoming SDI and compressed ASI or IP signals, the MPEG Series monitors are suitable for any point in the broadcast chain. Featuring as many as four integrated displays, one unit can be used to monitor many areas of the broadcast chain. When more signals or more demarcation points require monitoring, several units can be used to handle more signals across the chain. By employing a single unit and just one interface for all signals, broadcasters can significantly simplify their monitoring operations. The most basic monitoring method using MPEG Series monitors is a single-channel-encoder monitoring model, often used in contribution and distribution signal flows. (Figure 1) Because MPEG Series monitors can accept both baseband and compressed signals, operators can monitor both the SDI playout feed going into the encoder and the encoder's compressed output side by side. The baseband input of the MPEG monitor can accept signals from SD-SDI up to 3G HD-SDI 1080p60 with full 4:2:2 support. The decoder in the MPEG monitor is capable of supporting broadcast standards including DVB, ATSC, and ISDB, with video encoded as MPEG-2 and MPEG-4. In the event that multiple encoders within the facility are feeding uncompressed streams from various sources into an encoder and the resulting MPEG streams into a multiplexer to create a multi-program transport stream, MPEG Series monitors can provide visibility all along the signal flow. Monitoring between sources and the encoder, the MPEG-2443 and its four 4.3-inch displays enable simultaneous monitoring of up to four SDI feeds. (Figure 2) On the other side of the encoder, the same model affords at-a-glance monitoring of four single-program transport streams as they are fed into the multiplexer. With dual 9-inch displays, the MPEG-4290 allows users to select and view program audio and video, as well as data including the program allocation table (PAT) and program map table (PMT). Monitoring Across Baseband and MPEG Transport Stream On the baseband feeds from playout or a live shoot, one of the first checks is correct signal identification. The MPEG monitor will show the resolution, scan type (interlaced or progressive), and the frame rate of the signal. Operators can check the presence of the correct audio channels by displaying audio bars, which can be adjusted to show any of the common audio level scales. The safe area "cage" allows users to check the content to see how it will display on an overscanned monitor and confirm that all important content, including text such as phone numbers, will be visible to the viewer. Above all, the most important test is whether the end user can see the picture and hear the audio without any breakup. 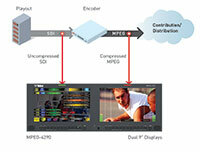 The MPEG monitors can display content from SD up to 1080p60, which covers almost all broadcasted content. On the audio side, any of the 16 channels can be isolated for listening via built-in speakers or headphone jack. All of these elements can also be monitored on the decoded elementary streams. Moving down the broadcast chain to the compressed domain, operators can use integrated MPEG decoders and analyzers to inspect the components of the transport stream, including the program number, PMT number, and service description along with elementary stream components such as video, audio, and data PIDs. All of the stream components are shown with the bitrate of the component, and this allows the operator to see that there is actual data for the element, rather than just a reference to it in a data table. Delving deeper into the transport stream, the user can look into the PMT tables to inspect all of the stream elements and confirm that the correct encoding type is being used for audio and video. Any additional audio streams, including extra language tracks, can be selected for playback. Finer detail about the stream is provided by the PSI tables, also available for review. Typically, however, the display of both PMT and PSI tables is complemented by alarms that reflect transport stream health. Using a subset of the ETR101290 standard, the monitor can inform the user if tables are late or have not arrived at all, if they have arrived but are out of specification, or if they have arrived and are within specification. As signals are being encoded and multiplexed for distribution, the right deployment of monitoring equipment can make it easy to view all parts of the broadcast chain and quickly identify potential faults. Robust monitoring solutions, such as Wohler's MPEG Series units, address this requirement by allowing users not only to see and hear the video and audio, but also to dive into the MPEG transport stream components, validate all elements created in the broadcast chain, and maintain the integrity and value of the content that passes through their facilities.